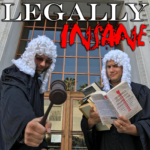 Today Matt and Tony will break down the history of horrible laws that were passed to eradicate Native Americans. They dive deep into the dark history of how the US government made it impossible for the Natives to participate in commerce and slowly robbed them of their rights and culture. You’ll also learn about the Oklahoma Land Rush and the real meaning of the Oklahoma Sooners. [07:30] – The USA’s active attempt to destroy Native American Culture. [09:30] – Johnson v. M’Intosh in 1823. [12:00] – US v. Kagama in 1886. [28:54] – The Oklahoma Land Rush of 1889. On April 22nd, 1889, 50,000 people on foot and on horses rushed into the city to claim land. [20:16] – The Oklahoma “Sooners”, are named after people who cheated and illegally claimed land before April 22nd. The Takeaway – Do something nice for your local native tribe.